Expectations were big and it has surpassed them. Next: vs. Birmingham, Friday, 7 p.m.
Area’s biggest step-up win beating San Juan Hills, 19-7. Impressive wins over Thousand Oak, Troy and Mira Costa. Next: at Colony, Friday, 7 p.m.
Was two-point conversion away from beating JSerra. Next: at Rancho Cucamonga, Friday, 7 p.m.
Winning by a ridiculous 26-point margin, San Dimas next. Next: vs. San Dimas at Covina District Field, Saturday, 7 p.m. Destroying everyone in its path and not against pushovers. Next: at Don Lugo, Friday, 7 p.m.
Next: at Westlake, Friday, 7 p.m.
Defense kept it close in overtime loss to St. Paul. Next: vs. Glendora, Friday, 7 p.m.
Was leading 29-6 when game cancelled after brawl at Oakland’s Stellar Prep. Next: vs. Rancho Christian, Friday, 7 p.m.
Next: vs. Bonita at Covina District Field, Saturday, 7 p.m.
Fell short in 14-6 loss to Ayala. Next: at Moreno Valley View, Friday, 7 p.m. Ran away from Charter Oak in second half to win, 21-7. Rally came up short in 31-27 loss to Hart on the road. Next: at Burroughs, Sept. 14. The opponents are tough, but the losses are piling up. Next: vs. Calabasas, Friday, 7 p.m. Offense cooking after 56-21 win over Schurr. Beau Hobbie was ridiculous in 76-36 win over El Monte. Next: vs. Santa Fe, Friday, 7 p.m.
Should be rested after bye week. Next: at West Covina, Friday, 7 p.m.
Next: vs. Arrowhead Christian at Citrus Valley High, Friday, 7 p.m.
Another undefeated Mission Valley League team. Next: at Temple City, Friday, 7 p.m.
Defense was awful in blowout loss to San Marino. Next: at Orange Vista, Friday, 7 p.m.
Saturday Morning Quarterback: Sometimes a running clock might be a bad thing. That is if your’e a fan of making history. A few years ago, the CIF Southern Section mandated that any game where a team held a 35-point or more lead in the fourth quarter would be played with a running clock in order to put the losing team out of its misery sooner. But one unintended consequence of the rule is that it will limit the chances of offensive records being broken. Such was the case on Friday night when San Marino running back Beau Hobbie was flirting with getting his name in the record books due to his five touchdown runs at halftime. San Dimas cruises past Whittier: San Dimas High kept its offense rolling for the second week in a row and cruised to a 49-14 nonleague victory over Whittier on Friday night. The Saints (2-0) moved the ball on the ground and through the air equally as senior quarterback Dylan O’Leary (5 for 9, 74 yards) threw for two scores and three touchdowns came by way of the run. Bishop Amat’s rally falls short: Bishop Amat’s loves do-or-die situations and figured since it came all the way back, why not go for the go-ahead two-point conversion with just over a minute left against JSerra, ranked No. 7 in CIF Southern Section Division 1. Bishop Amat coach Steve Hagerty has won some and lost some going for it all before, so he had no regrets after the Lancers came up short in their upset bid on Friday at Kiefer Stadium. Amat quarterback Blake Archuleta, who threw a six-yard touchdown pass to Donavan Clinton to bring the Lancers’ within a point with 1:01 left, couldn’t convert with Jaden Allen on the two-point conversion, allowing JSerra to escape with a 21-20 victory. La Habra comes up short against Mission Viejo: Mission Viejo’s defense showed no favoritism against visiting La Habra on Friday night, and it was a good thing for the Diablos. The Highlanders defense eventually locked down, too. A week after collecting four interceptions against Santa Margarita, the No. 3 Diablos grabbed two more against the No. 12 Highlanders and followed JoJo Forest and Joey Yellen to a 28-14 victory in a duel of top public schools. Arroyo too much for Schurr: Even though Arroyo senior quarterback Ernesto Camacho put together an overall complete performance against Schurr High, the Knights’ gunslinger still thought the team didn’t have its best performance. The 6-foot-1 Camacho, who led Arroyo to a CIF Southern Section title two years ago, looked every bit like a veteran signal caller going up against a young Schurr defense, completing 20 of his 35 pass attempts for 240 yards and a pair of touchdowns. Thanks to Camacho’s effective play and four unanswered first-half touchdowns, the visiting Knights cruised to a 56-16 victory over the Spartans in a non-league contest on Friday night. Back-up QB leads St. Francis to win: If the St. Francis High football team was going to bounce back this week from a last-minute season-opening loss, it would probably need to rely on the strong arm of quarterback Darius Perrantes. But a high fever kept him off the field and in street clothes before the game. That’s when backup Doyle Kane got the call to start. Kane filled in admirably, completing 13 of 18 passes for 235 yards and two touchdowns as the Golden Knights cruised to a 38-21 win over Damien in nonleague action Friday night. Beau Hobbie runs wild in win over El Monte: The big question entering Friday night’s nonleague game between San Marino and host El Monte was whether the Lions could play with one of the top teams in the area. If their performance was any indication, the Lions have more work to do. The Titans (2-1) jumped out to an early lead and throttled the Lions, 76-36. The game featured an outstanding performance by San Marino running back Beau Hobbie. The senior carried the ball 22 times for 308 yards and six touchdowns. To say that coach Mike Hobbie was pleased with his grandson’s performance was an understatement. La Serna holds on for victory: La Serna High’s potent offense had scored 92 points as the Lancers won their first two games, and they looked poised to light up the scoreboard again on Friday night as they scored 17 first-half points against Mira Costa. But the Lancers were held to only one touchdown in the second half, while it was their defense that came to the rescue, forcing three turnovers deep in their own territory to clinch a 23-20 victory. Diamond Ranch comes up short against Ayala: The football gods seemed to be conspiring against Ayala senior wide receiver/cornerback David Diaz entering Friday’s game against Diamond Ranch. Not only was he battling a stomach illness that dehydrated him during the game, but he was covering Diamond Ranch’s standout 6-foot-2 sophomore wide receiver, Cristian Dixon, who already has a college offer from USC, among others. As far as thrilling finishes go, this was fun. Los Altos hung around long enough to take its first lead late in the fourth quarter, but St. Paul came back with big plays and big stops to squeeze out a 31-25 victory in double-overtime to remain undefeated on Thursday. St. Paul running back Mateo Rico scored his second touchdown on a 2-yard run to win the game in double OT, improving the Swordsmen, ranked No. 4 in CIF Southern Section Division 5, to 3-0. Glendora took home the Mayor’s Trophy for the first time since 2013 with a 21-7 win over Charter Oak at Citrus College on Thursday night. The Chargers (0-3) were playing with heavy hearts as head coach Lou Farrar’s older sister passed away Thursday morning after battling a long illness. “We’ll miss her,” Farrar said. “She was a one of the biggest Chargers fans for a long time.” The Tartans (2-1) scored twice in the fourth quarter to break a 7-7 tie in a defensive battle that looked destined for overtime. Pomona High School’s source of optimism toward a fifth consecutive Miramonte League title this season rested with the return of quarterback Daniel Limon, who lived up to the billing Thursday. The senior threw for 404 yards and four touchdowns to lead the Red Devils to their second consecutive win with a 53-27 victory over visiting El Rancho in a nonleague game. Throughout the history of its football program, South Hills High has never shied away from challenging some of the top teams from Orange County and coming away successful. It happened again Thursday night. Junior Juaquin Elliott had 31 carries for 120 yards and scored both of South Hills’ touchdowns as the Huskies (3-0) upset San Juan Hills 19-7 at Covina District Field. Weekly two-minute drills highlight the week’s best high school football games from the San Gabriel Valley Tribune, Whittier Daily News and Pasadena Star-News, with predictions from our panel. But we lead with the “One More Thing” predictions, which highlights several games and touches on hot topics. Mater Dei’s forfeit and defensive minded win over Paramount leaves Amat undefeated. Next: vs. JSerra, Friday, 7 p.m.
Major victory over Lompoc; Swordsmen are back. Easy win over Wilson, the big test comes next. Next: vs. St. Paul, Friday, 7 p.m.
Back-to-back impressive wins over normally good opponents. After bye, heads to Oakland to play Stellar Prep. Next: at Oakland’s Steller Prep, Friday, 7 p.m.
Steve Bogan offense averaging 52 points a game. Next: vs. Riverside Poly at Ramona High, Friday, 7 p.m.
Defense has been solid two straight weeks, toughest game next. Next: vs. San Juan Hills, Thursday, 7 p.m. Huge come-from-behind 28-27 win over Chino Hills. Next: vs. Ayala, Friday, 7 p.m.
Big second half in 28-10 win over San Marino. Next: vs. West Covina at Covina District, Friday, 7 p.m.
Rally falls short against Mira Costa. Next: at vs. Damien, Friday, 7 p.m. Still no match for Cathedral in 27-10 loss. Next: vs. Hart, Friday, at College of the Canyons, 7:30 p.m.
Next: at Mission Viejo, 7:30 p.m. Impressive first two weeks, big one on road next. Next: at San Dimas, Friday, 7 p.m. Rolled up lots of offense in 48-14 blowout over Long Beach Wilson. Next: vs. Whittier, Friday, 7 p.m.
Couldn’t stop Corona Roosevelt in 48-21 loss. Next: vs. Charter Oak at Citrus College, Thursday, 7 p.m. Offense came alive in 41-9 win over South El Monte. Next: at West Covina, Sept. 7. Has been awful in second half two straight games. Next: vs. Glendora at Citrus College, Thursday, 7 p.m.
Next: vs. Mayfair, Thursday, 7 p.m.
Winning by 42-point margin through two games. Next: vs. San Marino, Friday, 7 p.m.
Next: at Schurr, Friday, 7 p.m.
Saturday Morning Quarterback, St. Paul makes biggest statement of the night: It just might be time to wake up the echoes at old St. Paul. The Swordsmen got tested for quality on Friday by perennial power Lompoc. And despite playing without their best offensive weapon and falling behind 13-0, St. Paul rattled off the next 31 points for a 31-13 victory that’s arguably the school’s biggest in years. Northview football pulls away from San Marino: A slow start gave way to a strong second-half surge as the Northview High football team pulled away for a 28-10 win over San Marino in nonleague action Friday night. The teams were tied 7-7 at halftime before Northview (2-0) outscored the Titans 21-3 in the third and fourth quarters, thanks to some big plays by junior quarterback James Jimenez. He threw two of his three touchdown passes in the second half and ran for another score. Bishop Amat’s defense helps in win over Paramount: The Bishop Amat football team struggled offensively, throwing more than it probably wanted to while struggling to get a run game going with junior Damien Moore missing with an injury. But Amat did enough to earn a 21-6 victory in its home opener over Paramount, ranked No. 2 in CIF Southern Section Division 4. St. Paul beat Lompoc without Que Allen: For as much as it’s possible make a statement in high school football before Labor Day, that is exactly what St. Paul did on Friday night. A Lompoc mistake just before the half opened up the floodgates for St. Paul, and the took full advantage erupting for 31 unanswered points en route to a stunning 31-13 victory over Lompoc. Diamond Ranch football edges Chino Hills in thriller: Diamond Ranch High School was viewed as one of the area’s darkhorses coming into the football season. The Panthers have not only lived up to that assessment, but now area teams better take notice after Kejon Gibson blocked a 37-yard field by Gabriel Chavers with less than a minute to play to preserve the Panthers’ 28-27 win over Chino Hills in a nonleague game Friday at Diamond Ranch. Cathedral football’s second-half surge sinks Arcadia: For one half on Friday evening, the Arcadia High football team matched Cathedral’s effort on both offense and defense. However, the host Phantoms (2-0) dominated the second half and easily dispatched the Apaches, 33-10 on Friday evening. Alemany’s big second half buries Charter Oak: Charter Oak, hoping to bounce back from last week’s upset loss in its season opener, couldn’t stop Alemany’s passing game as it dropped a 33-3 decision on Friday night. The Warriors, (2-0) who haven’t made the playoffs since 2013 when they went to the CIF Southern Section Pac-5 division semifinals, rode the right arm of sophomore quarterback Miller Moss, who completed 23 of 30 passes for 353 yards and three touchdowns, to their second win of the year. La Serna football delivers more offensive fireworks in win over Troy: After an overwhelming season-opening win last week, La Serna High continued its offensive fireworks with another decisive victory Friday night in a nonleague game at Cal High. The Lancers, behind two touchdowns from senior running back Robert Ruiz (72 yards on eight carries), defeated visiting Troy 49-26. Redlands East Valley football stuns La Habra in overtime: There is a new man in charge of the Redlands East Valley High football program this year, but the magic lingers. Few would dispute that Friday night following the Wildcats’ pulse-pounding 22-21 overtime victory over La Habra. South Hills 39, Don Lugo 7: If there wasn’t a lot of buzz about the South Hills High School football team before the season, there’s nothing like back-to-back blowouts to create the buzz for you. 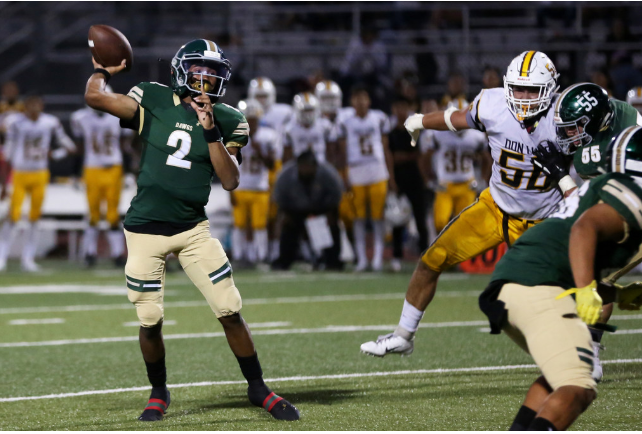 South Hills picked up where it left off last week, routing visiting Don Lugo 39-7 at Covina District Field on Thursday behind another steady performance from sophomore quarterback Khalil Ali, and a defense that was one blown play away from posting a shutout. Mayfair 39, California 21: The California High School football team was hoping that Thursday’s game against Mayfair would turn out better than last year’s 27-point loss to the Monsoons that still resonated with them. For a while, Cal managed to go toe-to-toe with the reigning Suburban League champions, but thanks to a four touchdown performance from Mayfair running back Tstrong Mataele, the Monsoons cruised to victory again, beating Cal 39-21 in the nonleague affair.